The town of Ha'iku on the Hawaiian Island of Maui exudes peace, tranquility, and natural beauty. Ha'iku stretches from Maui's North Shore to the slopes of Haleakala Crater. Residents and visitors are afforded panoramic views of the Pacific Ocean, are kept cool by the shade from a variety of majestic trees, and are treated to beautiful sights and scents provided by lush tropical flora and fauna (many of which exist nowhere else in the world). Residents include many "locals" who trace their Maui roots to the days when Ha'iku first became a thriving plantation town - supporting the island's dominant pineapple and sugarcane industries - more than 100 years ago. Many of the agricultural workers in the 19th and 20th centuries were Chinese, Filipino, Japanese, Portuguese, and Puerto Rican immigrants and their often mixed-race children and grandchildren. Those industries are now nearly defunct, and Ha'iku is largely a bedroom community. A few vacation rentals are open for visitors who want an alternative to Maui's glitzy mega-hotels, providing in-town employment for some Ha'iku people. But most residents commute to the resort areas of Lahaina and Wailea, the county seat of Wailuku, and the industrial and commercial center of Kahului. In addition to local families, Mainland transplants are common in Ha'iku. Some of them are environmental and peace activists who moved to Hawai'i in the '60s and '70s and contribute to the widely held view that Maui's North Shore is a haven for aging hippies. Native Hawaiians are also represented, as are descendants of the Christian missionary families who dominated Hawai'is political and economic life for decades, until after World War II. Ha'iku is a diverse, casual, beautiful town. It's against this backdrop that we encounter Veg Out, one of only three 100% vegetarian restaurants on Maui. Veg Out embodies Ha'iku sensibilities. The restaurant and its staff seem genuinely committed to the cause of serving tasty, healthy, ethically produced food representing many cultural traditions, while they lack almost sll pretense and offer a welcoming, casual atmosphere of Aloha. How welcoming? On any given day, French, German, and the dialect known as pidgin English may all be heard in the dining area. How casual? All of the staff and 90% of the customers wear T-shirts and shorts, and the food is served on paper plates. Ah, yes, the food. 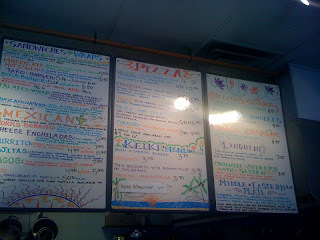 Diversity is the trademark, with Asian, Italian, Mexican, and Middle Eastern food all featured on Veg Out's large menu (unpretentiously presented on a white sheet of paper). 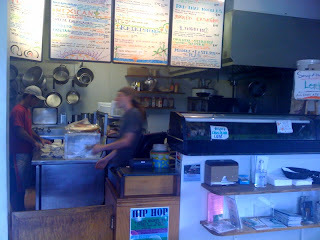 Most of Veg Out's entrees are vegan; the few with dairy products can be easily converted to vegan. I probably partake in the Middle Eastern offerings more than any of the other genres simply because that kind of food is so rare on the island. Affordable "Starters Sides" are the first items listed on the menu. Two large scoops of brown rice are available for $1.50 (cheaper than a cup of coffee anywhere on Maui). The most expensive item in this category is Breaded Tofu Chunks ($4.25). For between $2 and $4 you can get orders of Soybeans, Steamed Veggies, Garlic Bread, or the always-vegan Soup of the Day. These items are all tasty. But I rarely order them because I've learned that all the main courses are so large. Salads is the next menu category. Each large salad could be an entire meal, with prices ranging from $5.75 for the Veg-Out Salad (Romaine, tomato, cucumber, red onion, carrots, mushrooms, sprouts) to $6.95 for the Greek Salad or Ensalada Salad. The latter is an exquisite, highly recommended Mexican salad featuring seasoned tofu, freshly made salsa, and guacamole - zesty and satisfying. Next comes the Keiki Menu for children, which includes veggie dogs, burritos, and tofu nuggets - each selection comprising a full meal for only $3.75. Veg Out's most expensive items are in the Pizza category. 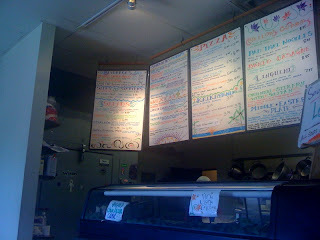 The menu lists five types of pizzas (available in 6- or 12-inch sizes), with the price peaking at $16.95. Because the pizza types can be combined or substituted and toppings mixed and matched, there's actually an endless variety of pizzas that could be prepared. The restaurant's signature pizza is the vegan Freedom pizza, with red sauce, garlic, peppers, onion, tomato, mushroom, tofu, and zucchini, topped with pesto and nutritional yeast. Sandwiches & Wraps are available for between $5 and $7 each, including the Boca Burger and Taro Burger (both served on Foccacia bread), the Cajun-style Muffalata Sandwich, the Avocado Wrap and Falafel Wrap (each in a whole wheat tortilla), and the Hot Italian Seitan Sandwich. Incidentally, taro (also known as kalo) is a staple of the Hawaiian diet and is a starchy vegetable similar to potato. Traditional Mexican entrees - tacos, burritos, enchiladas, and fajitas - are offered for between $6 and $8. Each Mexican plate comes with beans, salsa, and guacamole, making for tasty and hearty meals. The Pasta category features Baked Lasagne ($8.95) and Linguine ($7.95). Both dishes are good. But I rarely order them, partly because similar entrees are widely available elsewhere and partly because the dishes will include dairy products unless the customer asks to exclude them (meaning they're not truly conceived as vegan items). My favorite menu item is the huge Middle Eastern Plate ($9.95). This entree is made up of housemade baked falafels, humus, and spelt flatbread, served with spring mix greens, tomato, cucumber, and a tahini cilantro sauce. Nothing that tastes quite like it is available at any other restaurant on the island. That makes it feel a little exotic. But the taste isn't so exotic as to be strange or completely unfamiliar. Fresh-made juices and vegan smoothies are available for $3.25 to $4.50. The menu offers a few suggestions, but the customer is free to choose ingredients from among the many fresh fruits that are always on hand. Overall, I think Veg Out is amazingly good in almost respects - as long as you're not looking for fancy decor or service. Oh, finally, don't forget to finish your meal with Veg Out's decadent vegan chocolate cake. 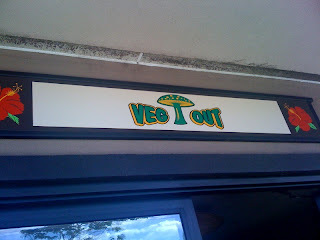 Veg Out is located at 810 Kokomo Road, Ha'iku, Maui, Hawai'i USA. Hours are 10:30 a.m. to 7:30 p.m. on weekdays and 11:30 a.m. to 7:30 p.m. on weekends.